The play "Suma no Miyako Genpei Tsutsuji" was originally written by Hasegawa Senshi and Matsuda Bunkôdô for the puppet theater (Bunraku) and staged for the first time in the 11th lunar month of 1730 in Ôsaka at the Takemotoza. It was adapted for Kabuki 33 years later by the playwright Namiki Eisuke I, entitled "Sakigake Genpei Tsutsuji" (the second drama of an unusual 3-part kaomise program) and staged at the Naka no Shibai in the 11th lunar month of 1763, starring Nakamura Kichiemon I and Arashi Hinasuke I in the roles of Kumagai Jirô Naozane and Taira no Atsumori. 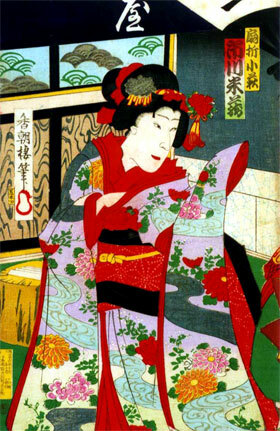 The "Gojôbashi" scene, which was not in the original puppet drama, was added to the drama in the 2nd lunar month of 1832 in Ôsaka at the Kado no Shibai [more details]. The new scene was a kind of parody of the famous encounter on the Gojô Bridge in Kyôto between the young boy Ushiwakamaru and the warrior priest Musashibô Benkei. Only 2 scenes have survived, "Ôgiya Mise" (At the Fan Shop) and "Gojôbashi" (At the Gojô Bridge). The first scene was the kiri of the 2nd act in the original drama and the second scene was a 1832 Kabuki add-on. Taira no Atsumori, a young warrior of the Heike Clan, is remaining in Kyôto although most of the leaders of his clan have fled to the western part of the country after their defeat in a battle against the Genji Clan. As Genji clansmen plan to slaughter all Heike remnants in the capital, Atsumori is taking shelter in a fan shop (ôgiya) on Gojô Street, disguising himself as Kohagi, a female assistant to Kazusa, the fan shop owner. When nobody else is around Kazusa and his wife reverently express their sympathy with Atsumori for his wretched state. The couple withdraws, leaving Atsumori alone, when their daughter, Katsurako, enters and asks Kohagi if she is in fact a man. Unable to continue his deception any longer, he admits to her that he is a Heike warrior named Atsumori. She then confesses her love and asks him to marry her. Atsumori says, however, that his life is so precarious that he cannot think of marrying anyone at this moment. Instead, he suggests to her to play her koto in concert with his flute. Soon after their withdrawal to the adjoining room a rustic samurai in a braided hat visits the shop and, seeing on the shelf a military fan bearing a crimson disk on a black ground, asks Kazusa to sell it to him. Kazusa says he cannot because he has promised to sell it to someone else. At this moment the sound of the flute and the koto comes flowing to their ears. A group of Genji warriors headed by Anewa Heiji and Kinezumi no Chûta raids the shop, apparently believing that the flute player is Atsumori, one of the wanted Heike warriors. Anewa demands that Kazusa help him arrest Atsumori, but Kazusa declares that Atsumori is not in his house. Suspecting, however, that Atsumori has disguised himself as a woman, Anewa begins examining Kazusa's female employees one by one. When Kohagi is brought in and Anewa tries to feel her breast, the rustic samurai interferes, introducing himself as Kumagai, a Genji warrior. Kumagai, who has been ordered by the Genji general Minamoto no Yoshitsune to protect Atsumori, asserts that Kohagi is a genuine woman. He tells Kazusa to vindicate Kohagi by bringing the real Atsumori who is hiding in his house. In compliance with this subtle suggestion of Kumagai's to substitute Katsurako for Atsumori, Kazusa kills his own daughter and brings her head for identification. 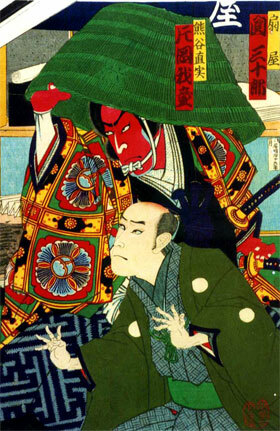 With Kumagai falsely asserting that the head is Atsumori's, Anewa and his men go away. Taking pity on Katsurako who was killed in his place, Atsumori dyes her teeth in black as a token of his acceptance of her as his wife. Standing at the foot of the Gojô Bridge, Taira no Atsumori mourns the death of Katsurako when Kumagai Jirô Naozane arrives on horseback and advises him to flee immediately from Genji pursuers. Tsutsumi no Gunji, a retainer of Kumagai, enters to convey to Kumagai the Genji commander's order to proceed to the Suma beach. Atsumori gives his military fan to Kumagai as his parting gift and promises to meet him in battle at the Suma beach. the title "Azaleas of the Minamoto and Taira clans in the Capital at Suma" comes from osakaprints.com.